A reclaimed, cast iron fire insert. The cast iron surround has a decorative arch with repeating border patterns, featuring crosses and twists. There is a pretty design at the top of the smoke flap and the curved front bars are intact. The fire and surround is in good, useable condition, however as the fire is reclaimed there are some slight signs of use and wear. 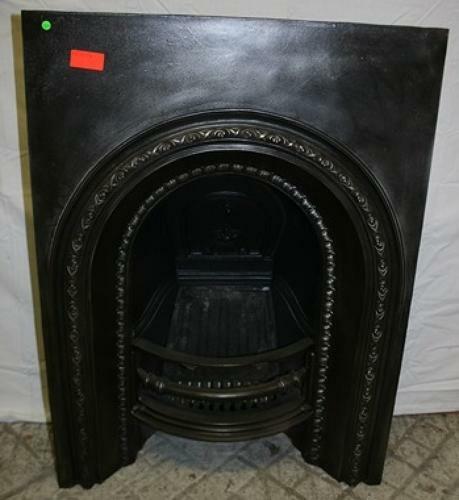 The cast iron fire insert has some very slight small scratches, pitting and marks but the iron has been blacked and polished, leaving an attractive finish and rich colour. The fire back has some surface rust. A lovely fire with a pretty design, perfect for a country or rustic interior, that will add great character and style to a home.